As a lover of good food and photography, you can imagine my delight when Mimi Thorisson announced a cooking and photography workshop. I had been following Mimi and her husband, Oddur, on Instagram for quite some time. Their photos are beautiful. Meals that leave me hungry, wine from their local region of Bordeaux, plentiful vegetables from their garden, and their beautiful children evoke memories from my own childhood, spent in Normandy with my French grandmother. Memories that are sacred to me. Sunday mornings were spent at the marché, first, to buy the chicken from the local farmer, and then a basket full of potatoes, still covered in dirt. On the walk home, we would visit the boulangerie to pick up a fresh baguette, often still warm, and when I would longingly look at the rows of delicious éclairs and tartes aux framboises, Mamie would always give me a smile and nod, adding a tray of mini pâtisseries to our order. Once home and the groceries were put away, I would roll up my sleeves, eager to help. Yesterday's newspaper spread across the kitchen table (it made for easy clean-up), I would peel the potatoes until the scraps created rising heaps and my hands grew tired. Sitting on my stool, I then waited for my next task. Some people will claim that these Sunday meals tasted so good because they're associated with emotion, and perhaps they're right. But I will argue only to an extent, because I still deem my grandma as the best darn cook. With these memories close to heart, months later, I found myself in Saint Yzans-de-Médoc, chez Mimi and Oddur's for three days of cooking and photography. 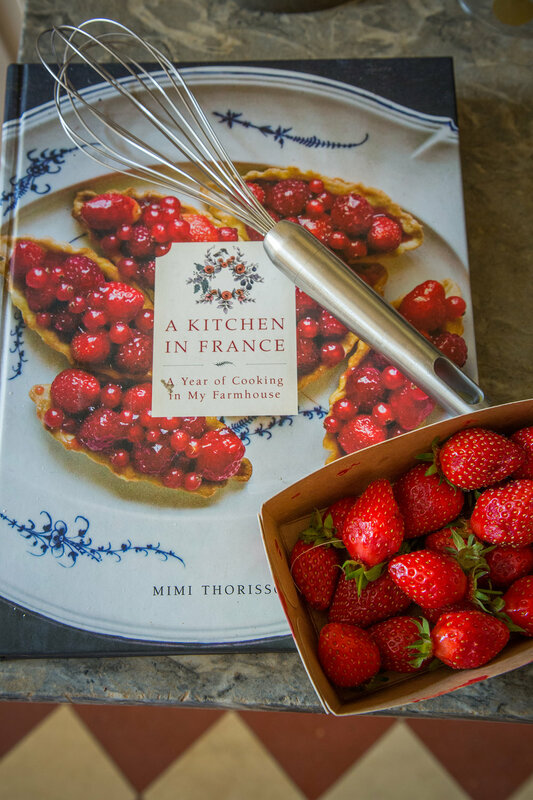 Pigeon, cherry clafoutis, soufflé, chou farci and endive tartets, rolled to look like roses, were just a few of the recipes we made from scratch, all from Mimi's latest cookbook. All the photos were taken at their home, which is even more beautiful in person. Hard to imagine, I know. When I left Bordeaux, I felt re-inspired to cook. Not just for me, but for my friends and family, and as Mamie did and in her spirit, for generations to come. Bon appétit.